"This is the creamiest tomato soup I have ever had." 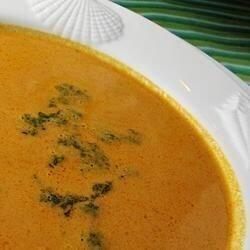 In a large stock pot, combine tomatoes, chicken broth, butter, sugar, onion, and baking soda. Bring to a boil over medium-high heat; reduce heat to low and simmer for 1 hour. Stir in cream; cook until heated through and serve. This recipe could be a 5* but it's WAY TOO SWEET, (IMO)! I had to add a lot of salt to make it edible. I will definitely make this again but omit the sugar altogether.